iPods are everywhere! You see them on buses, in DMV lines, at the beach, and even in bars. Like your cell phone, this handy little digital device is so portable and convenient, it’s become an iGeneration must-have and impossible to leave home without. With everyone carrying so many songs in their pockets and purses, it’s time they had a pocket-sized guide! InThe iPod and iTunes Pocket Guide trusted gadget teacher and best-selling author Christopher Breen reveals the secrets to using the leading digital audio player and offers the quickest way to learn how to use the iTunes Music Store, import songs from CDs, create on-the-go play lists, and more. 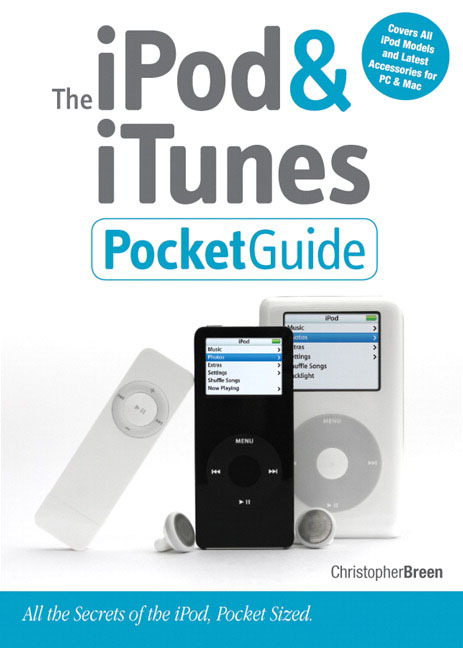 In this low-priced guide, you’ll find compact-yet-detailed coverage of the entire iPod family, including the iPod shuffle and the revamped iPod, and hints for accessorizing iPods, tips for making the most of the device's storage capabilities, troubleshooting advice for when the gadgets become uncooperative, tips on podcasting, and more! Chris Breen has been writing about music and technology since the latter days of the Reagan Administration. Contributor to such publications as Macworld and PC World, he pens Macworld's popular troubleshooting column,"Mac 911". He is also editor in chief of Playlistmag.com- a web site devoted to digital music.